This quick review was provided by Norienne, who is gluten free due to Celiac Disease. I was somewhat concerned about Chefs de France, as I had read a review where someone with food allergies had a terrible experience. Fortunately, my fears were unfounded! My husband and I came here for dinner. I had noted my dietary restrictions when making the reservation, and mentioned them again to the hostess when we checked in. We were seated just a few minutes past our reservation time. Our waitress was very nice. I asked her about seeing a chef, and she told me that nearly everything on the menu except the pasta could be done gluten-free. She said to look through the menu and see what I wanted, and she would go and double-check with the chef. 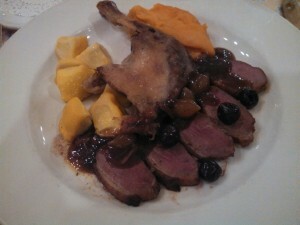 I ordered the duck breast and leg confit with cherries, sweet potato puree, and patty pan squash. A few minutes later, the chef came out and explained that the sauce the duck usually came with was made with a roux and thus not gluten-free, but that he could substitute another sauce, which I said would be fine. Soon after, my husband was given a demi baguette and I was given a warmed gluten-free roll, which was a little dry but still nice to have. The duck was very good. The sauce was served on the side and was, I think, the sauce that usually goes with the short ribs. It was rich and had pearl onions in it, and went better with the duck and cherries than I would have expected. The sweet potato puree was smooth and velvety, and the patty pan was perfectly cooked and well seasoned. For dessert, I was offered sorbet, chocolate mousse, or creme brulee. I chose the creme brulee, and it was my favorite dessert of the entire trip. Overall, everything was delicious and I would definitely recommend it. 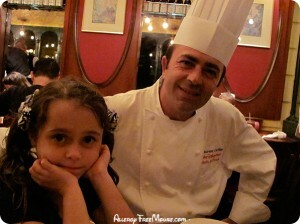 If you would like to review Chefs de France or any Disney restaurant, submit a food allergy dining Quick Review. This quick review was provided by Jennifer, whose daughter is allergic to gluten and dairy. We had a great experience at Chef de France when we went in November! My daughter has an allergy to gluten and dairy which we noted in our reservation. When we were seated our waiter Leo asked about our allergies, assured us they could work with it and brought the chef to our table. The chef (can’t remember his name) asked my daughter what she liked to eat and when she said chicken, he said that would be easy and took her order for roast chicken, roasted potatoes and steamed broccoli. She was unable to ea he gluten free roll they offer so they gave her sliced cucumbers instead (at her request). It was a wonderful experience and we all enjoyed ourselves! Chefs de France is a wonderful French restaurant located in Epcot. It can be very difficult to get reservations, and there may be a slight wait, but it’s worth the effort. As a non-Disney owned restaurant, or “operating partner”, we were a bit skeptical about dining with a food allergy. However, the Chef and staff were fantastic. Chef Laurent came to our table and asked about our daughter’s allergy, and gave us our options. We were shock that there were so many for her that were dairy free. First of all, she enjoyed her first French baguette in a restaurant. He reassured us that it was made on site without dairy. She would have been thrilled with that alone! But, she ordered a romaine hearts salad with a dressing, that I made at the table, of olive oil, pepper, salt, garlic , mustard and vinegar. 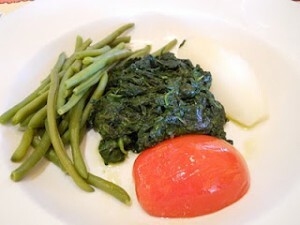 They were very accommodating and brought ingredients we requested to make our own dressing. She had the demi poulet fermier roti, pommes rissolées et tomate grillée, or a roasted chicken, herb-roasted potatoes, and a grilled tomato. This was the best chicken we’ve eaten in Epcot, hands down! There is no photo, because she dug in immediately. Then, just when we thought it couldn’t get any better, the Chef brought out raspberry and kiwi sorbet, again made on site in their kitchen. He assured us, again, that it was safe and completely free of dairy, and gave her a scope of each. She was thrilled and I don’t know how to express the joy it gave us to see her able to enjoy a meal in a French restaurant for the first time. This is why we love Disney! My husband and I both had the filet au Poivre, a delicious peppered steak in a peppercorn cream sauce. They were fabulously prepared and delicious, though not dairy free. Of course, we took precautions to keep everything separate on the table. We had to order our own French baguette, anyway, since our daughter had already claimed the first one as her own! She loved that so much.